This is the second book about Edgar Allan Poe and C. Auguste Dupin investigating a mystery. The combination of the real person and the detective he invented! It is not necessary to have read the previous book in order to enjoy this one. Here we have Edgar and his wife, Virginia, living in Philadelphia with her mother, Muddy. It is early 1844 and the city of Philadelphia is experiencing serious tensions between the ‘nativists’ and recently arrived Irish immigrants. Edgar receives strange parcels containing mummified parts of birds and he worries that they come from an enemy. He writes to Dupin in Paris because he fears that there is a threat to Dupin too. Eventually Dupin’s response is to travel to America. An acquaintance from London, Helena Loddiges, asks Poe to find out about the death of her lover on a boat in the Philadelphia docks. He does investigate but suddenly Helena is kidnapped so Poe and Dupin must find her. The historical background provided of America in 1844 is excellent and the clever utilisation of Poe’s own life. Virginia features as a co-investigator with Edgar and Dupin but her fragile health is emphasised. The mystery is exciting with South American explorations at the centre. The first book about Poe and Dupin was Edgar Allan Poe and the London Monster. Karen Lee Street was born in Philadelphia, but has lived in London for most of her adult life, and currently resides in Newcastle, Australia. She is the author of Writing and Selling Crime Film Screenplays (2013), short story collection Tattoos and Motorcycles, and Edgar Allan Poe and the London Monster (2016), the first in a Poe/ Dupin mystery trilogy. 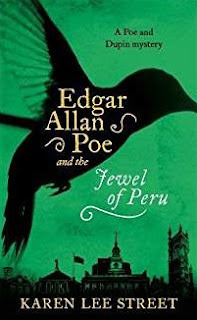 Edgar Allan Poe and the Jewel of Peru will be published in May 2018. Karen has a PhD in Writing from the University of South Wales and has worked for many years in the European film industry.